If you enjoy having birds as pets, you might want to look into owning ringneck doves. These sweet-natured birds are affectionate, easy to care for and train and are not raucously noisy like many pet birds are. But before you decide to bring one or more ringneck doves into your home, be aware that they can live 15 to 20 years, so be prepared to make a long-term commitment to caring for them. 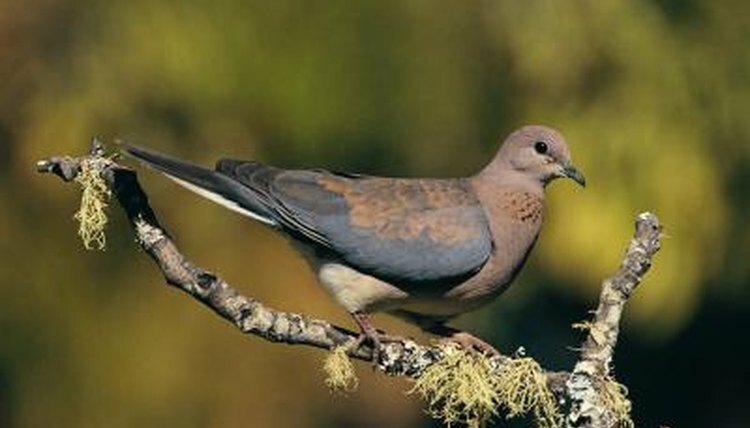 Also called collared doves and barbary doves, ringneck doves have light greyish-brown plumage with lavender tones on the napes of their necks. They get their name because of the black half ring around their necks. They grow to an average length of 9 to 11 inches, with males slightly larger than females. Ringnecks are friendly, active birds and with frequent, gentle handling, they become very attached to their owners. You’ll soon become familiar with their low, constant cooing. You can keep just one dove, but typically they are happier in pairs. These doves mate for life, but will seek another partner after one dies. Provide a cage large enough for your dove to flap her wings without hitting the sides of the cage. A cage 24 inches high by 30 inches long is the minimum size for one dove. But with a cage that size, you need to give her daily time out of her cage for exercise and interaction. Otherwise, you’ll need a cage about 5 feet high by 32 inches long to properly house her. Provide a couple of perches or branches, newspaper or wood shavings to cover the floor, and non-spillable food and water dishes. One of the best things about owning ringneck doves is that you can house them either indoors or outdoors if you live in a moderate climate. In harsher climates, you can add heat or move them inside during cold weather. An outside aviary is a good option if you have more than one dove. Make sure the enclosure will keep out dogs, cats, birds of prey, mice, snakes or other predators. It should be made of sturdy welded wire, with holes no larger than one-half square inch. The cage should be as large as you can easily care for and placed in a sunny location. Ringnecks are primarily seed-eaters. They do well eating a quality commercial seed and grain mix that contains 12 to 16 percent protein or a wild birdseed mix. They also love treats such as finely chopped apples, broccoli, greens, mashed sweet potatoes and meal worms. Crushed eggshells or oyster shells provide an excellent source of calcium. You also need to give them bird grit to help them digest their food, and a constant supply of fresh water. Ringnecks are generally hardy, healthy birds. However, they are susceptible to several strains of Salmonella bacteria, a protozoan infection called Trichomiasis, and an intestinal disease called Coccidiosis. The best way to prevent these health problems is to regularly clean your bird habitat. Use covered food and water dishes to avoid contamination from bird droppings and sterilize them weekly. If your bird seems lethargic, has droopy or fluffed up feathers or has watery green droppings, quarantine her and seek immediate veterinary attention.